Posted in Music Applet on January 16, 2008 at 9:02 pm. The next release of Music Applet is approaching, with the main task remaining before 2.3.0 ships being to updating the translations. ar: 73 translated messages, 33 fuzzy translations, 14 untranslated messages. de: 8 translated messages, 23 fuzzy translations, 89 untranslated messages. es: 8 translated messages, 23 fuzzy translations, 89 untranslated messages. fr: 8 translated messages, 23 fuzzy translations, 89 untranslated messages. it: 38 translated messages, 51 fuzzy translations, 31 untranslated messages. ja: 8 translated messages, 23 fuzzy translations, 89 untranslated messages. nb: 12 translated messages, 18 fuzzy translations, 90 untranslated messages. nl: 106 translated messages, 14 fuzzy translations. pl: 106 translated messages, 14 fuzzy translations. pt_BR: 97 translated messages, 18 fuzzy translations, 5 untranslated messages. sv: 106 translated messages, 14 fuzzy translations. Clearly, some of the translations have been unmaintained for some time now, and trying to use them would actually be worse than not having them at all. Why? The “fuzzy” translations are ones where the string that had been translated doesn’t quite match what the program is using, so the “translation” that will be used might not actually be correct anymore. With some of these languages, the translated text is literally more likely to be wrong than right. So, unless someone volunteers new translations for German (de), Spanish (es), French (fr), Italian (it), Japanese (ja), or Norwegian (nb), I’ll drop them entirely rather than include them in the 2.3.0 release. If you’re interested in contributing, you can download the translation files and get to work. I’ll be contacting the translators who have contributed translations for Arabic (ar), Dutch (nl), Polish (pl), Portuguese/Brazil (pt_BR), and Swedish (sv) privately to let them know about the string changes since 2.2.1 and give them an opportunity to update their translations accordingly. I’m planning on pushing out the 2.3.0 release sometime in about a week. If you’re interested in maintaining one of the old translations, or wish to contribute a new one, but need a little more time, let me know. Thank you to all translators, past and present, who have contributed to Music Applet. I’m still amazed at how so many people have volunteered to contribute translations, even though this is the first time I’ve ever asked for any publicly. Posted in Music Applet on October 28, 2007 at 10:42 pm. Music Applet 2.2.1 has been released! As you might guess from the version number, this is primarily a bug-fix release. In particular, this release fixes a compatibility issue with GTK+ 2.12 that prevented the song information tooltip from actually having any song information in it. In addition to a few other, more minor, bug fixes, there’s also an updated Polish translation. Posted in Music Applet on June 10, 2007 at 8:42 pm. The latest version of Music Applet is finally out, and hopefully you’ll find it well worth the wait. The biggest change is that there’s now support for MPD, Quod Libet, and the original XMMS. There’s also now support for a notification popup whenever the current song changes, which can be disabled if you so choose. Of course, there’s also bug fixes and updated translations; take a look at the release notes and the changelog for all the details. Posted in Music Applet on February 10, 2007 at 5:31 pm. Music Applet 2.1.0 is out! This is mostly a bug-fix release, but there’s also a new plugin for Exaile as well as a new translation into Polish. The tarball‘s in the usual place. Posted in Music Applet on January 15, 2007 at 5:32 pm. The latest version of Music Applet, the GNOME panel applet that makes it easy to control your favorite music player, is out! Why the big jump in version number? While at first glance not much has changed, plenty’s different under the hood. 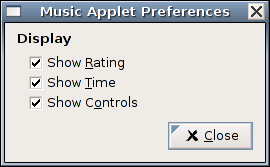 Music Applet also now gives you more control over the applet’s appearance than just showing or hiding the rating display. This should be helpful for people short on panel space. No longer are you stuck with whatever player support was available at compile time; Music Applet now has a plugin system that will make it much easier to add support for new music players without having to worry about recompiling things. Or compiling anything for that matter, as Music Applet has been reimplemented in Python. Those plugins are just little Python scripts you can drop into a search directory that the applet checks at startup. If you don’t care about plugins, that’s fine. Music Applet ships with plugins for all the players that older versions supported, so you shouldn’t run into any problems upgrading. In fact, this should make it easier for third-party distributors, since they can ship all the plugins together without forcing you to install a bunch of support libraries for music players you don’t want to use. If the dependencies for a plugin aren’t available, the plugin will quietly disable itself. In other words, the applet should just do the right thing, without you having to worry about anything. Download Music Applet 2.0.0 now! Posted in Music Applet on August 8, 2006 at 8:18 pm. The old site will automatically redirect you to the new one for a while (at least, until Purdue gets around to shutting down my account on their servers). Updating your bookmarks is highly recommended. Posted in Music Applet on June 16, 2006 at 12:28 pm. The ability to launch your favorite music player if needed. When there’s no music player running, Music Applet shrinks down to an ordinary launcher. There’s also several bug fixes (especially in the Banshee support) and a few new translations too. Posted in Music Applet on April 14, 2006 at 11:35 am. Music Applet 0.9.1 is out. The applet now supports XMMS2 in addition to Rhythmbox and Banshee. The right-click menu has been cleaned up, and there’s now translations for Norwegian and Portuguese. For those of you hoping Muine support would make an appearance, that’s been pushed back to 0.9.2. There’s also a whole bunch of other things I have planned for future releases, so stay tuned. Posted in Music Applet on March 28, 2006 at 11:20 am. As you may have noticed, Music Applet currently doesn’t have an icon. I don’t have the artistic skills necessary to make a good-looking icon for the applet, but you might. If you’d like to contribute an icon for Music Applet, please e-mail it to me. I’ll choose the best one and add it to a future release of the applet.